Home Our Founder The Master Answers How Do you Enlighten a Heart to Help Others? He asked: How do you inspire a heart to save others? One must first truly understand life. That is, we should analyze "When humans are born into this world, what is the most valuable?" I once analyzed and thought, nothing is more valuable than life itself. If one truly understands and acknowledges life's worth, one will naturally respect life. There will be a sentiment of respect for life and our affection towards all sentient beings will arise. Through this, there is equality and an undiscriminating love towards all sentient beings. The student admitted there are many things that still cannot see clearly. Because of this, he was always running and looking around but unable to understand. As a result, he was increasingly lost and was feeling much pain. Do we have to have seen everything in order for our heart to truly understand? 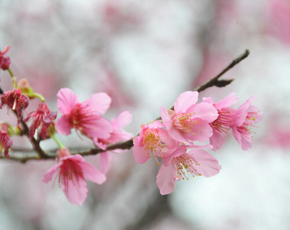 When we see the flowers blossom at this time, at this moment, do we have to travel around the world to prove that it is truly the blooming season here, and because of this, the flowers are blossoming? In reality, once we find a point, hold on to it and deeply ponder about it with our heart, and then we naturally gain understanding. It is like studying bacteria. We need to use a microscope to look at it closely in order to understand it. When we focus on this point, we will gain great understanding. On the road to pursuit of wisdom and knowledge, one should stay focused. Be precise, pragmatic but not over-ambitious. When we deeply study one discipline, we will be able to discover its marvels. It's just like choosing your area of specialization in school. We usually choose it based on which our interests lie. If we say we dislike it after studying it four years, after graduation, won't these four years be a waste? Therefore, if you have decided that you are passionate about medicine, then follow your heart and focus on studying it. Furthermore, you have to nurture this sentiment, an appreciation and love for life. With that, you will not say you have lost interest in the future and want to quit or switch to another discipline. It is important to focus our minds deeply and dedicate ourselves wholeheartedly. On then we can gain understanding of its wonders.